Admit it. You know you've always wondered what the story is behind the games of Munchkin that you play. Okay, maybe you haven't. But you know what? You're going to find out anyway. Last night at Origins we announced a deal with BOOM! Studios to produce a series of comic books based on Munchkin! They'll be monthly, with 4-issue story arcs; you'll be able to get it in print or digitally, through services like Comixology and iVerse; and the physical comics will come with bonus Munchkin cards! Note from Phil: This is one I've been wanting for years now. 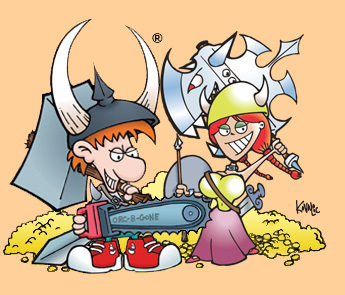 I've got emails from 2008 and 2009 pushing for a Munchkin comic book (and Steve's been talking about the possibility of Munchkin comics since the game was released in 2001), and I'm excited that BOOM! Studios has stepped up and is running with the ball. The best part of the comic books -- besides seeing what sort of wacky stories the creative teams craft around Spyke, Flower, and all of the Munchkin characters -- is that Munchkin fans will get to watch as the world of the game expands well outside of its gameland incarnation. I'd go into "brand extension" and "lifestyle" and other buzzywordy jargon, but for now I'll just sit back and smile and wait to see what's next for Munchkin.